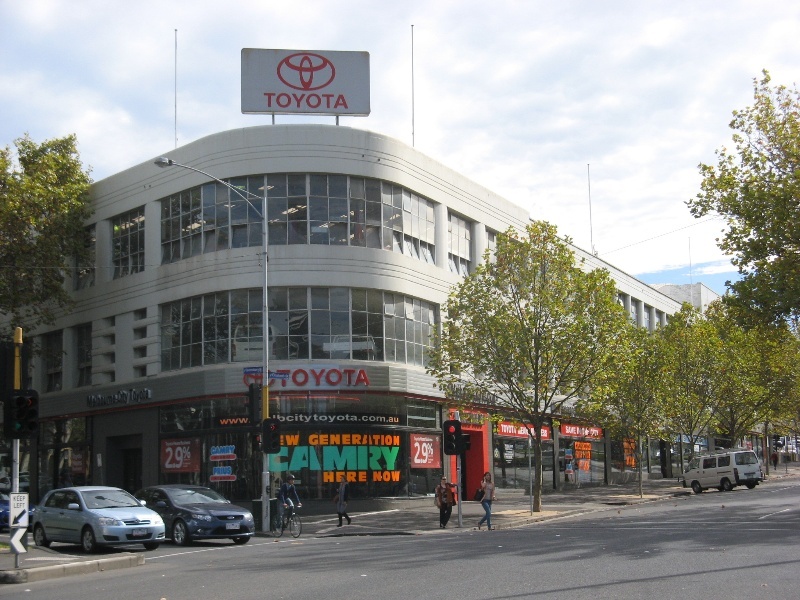 The former Melford Motors complex at 615-645 Elizabeth Street, Melbourne is a Streamlined Moderne style building on a prominent corner site bounded by Elizabeth, Queensberry and O'Connell Streets which housed Victoria's largest showroom and service facility for Ford vehicles. The complex comprises a three-storey wing built in 1936-7 and a two-storey building (dating from 1928) that was remodelled at the same time, both to the design of prominent Melbourne architect, Harry Norris. In the early twentieth century Ford vehicles were the best-selling in Australia, but they were imported from the USA and Canada until 1928, when the first locally-made Ford was produced at a new factory in Geelong. The need grew for authorised dealers and service facilities and Melford Motors, the name a contraction of Melbourne and Ford, founded in 1930 by the Melbourne businessman Arthur Fenton, became the exclusive dealer for Ford vehicles in inner Melbourne. By 1932 the firm operated from several premises around the city, including rented two-storey premises in Elizabeth Street. With sales booming as the effects of the Depression eased, Melford Motors purchased the Elizabeth Street building and the adjacent block on the corner of Queensberry Street and engaged Harry Norris to design a new building, incorporating the earlier one. The new building, constructed by Swanson Brothers, was described in the Argus as the 'finest car showrooms in the Commonwealth'. The ground floor was used for showrooms and offices, with used cars and the delivery department on the first floor and vehicle storage and servicing on the second floor. In 1953 Melford Motors was described as one of the world's biggest Ford distributors. In 1955 Norris was commissioned to design a substantial addition to the north, designed to blend with the older building. 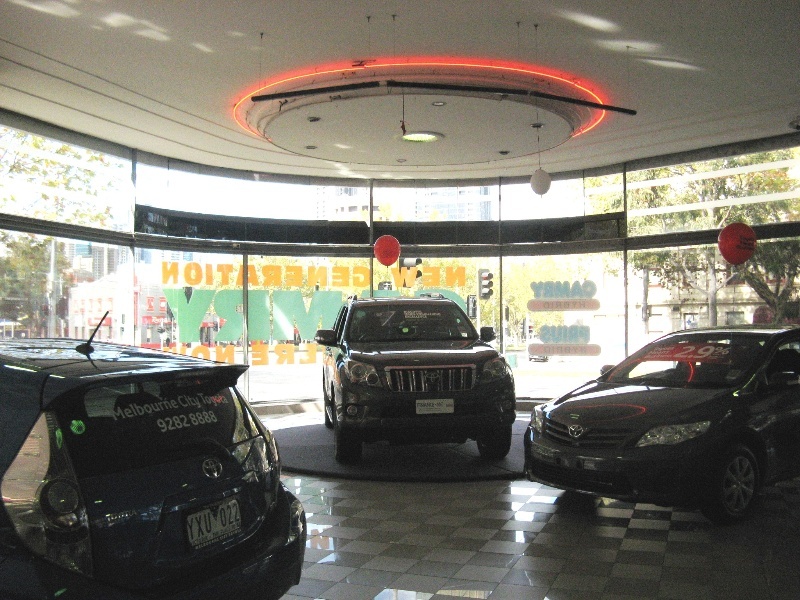 Melford Motors continued to operate from the building until 1990, when the company was sold to Melbourne City Toyota. The former Melford Motors building is composed of two parts: the remodelled 1920s building to the north and the 1936-7 section on the corner to the south. It is a three-storey building with a pale-coloured rendered facade. The continuous banding with incised shadow lines at the spandrel and parapet levels, and the wide bands of windows, broken only by curved piers, give a marked horizontal emphasis. The dominant feature is the curved corner, which on the ground floor level has a sixteen metre long showroom window made up of five individually curved panes of glass, which wraps around a display turntable (now not operative) above which is a circular suspended panel with recessed lighting. The ground floor on the Elizabeth and Queensberry Street elevations is made up of a series of wide showroom windows, which remain largely intact, apart from the replacement of some of the etched glass panels and the removal of the window boxes from the interior. The ground floor is still used as a showroom, and retains the original pillars, some with their fluted terracotta cladding, and the Moderne-style cornices, but the original offices have been replaced. The floors above, connected by concrete ramps, are used for the storage and servicing of cars and are largely open spaces with no decorative detailing. The former Melford Motors is of architectural and historical significance to the state of Victoria. The former Melford Motors is of historical significance as a reflection of the rapid expansion of the automotive industry, and of automotive retailing, in Victoria in the 1930s. Ford was the best-selling vehicle brand in Australia in the early twentieth century, and a boom in sales followed the beginning of local production in 1928 and the easing of the Depression. Melford Motors was formed in response to the need for expanded sales and service facilities, and its showroom was the largest and grandest motor vehicle showroom built in Victoria in the inter-war period. The former Melford Motors is of architectural significance as an outstanding and largely intact example of a motor vehicle showroom, a new building type which appeared in the interwar period. It is one of the last remaining substantially intact such buildings in Melbourne. It is significant as an example of the Streamlined Moderne style in a commercial setting, making the most of its wide street frontages to produce a building with a marked horizontal expression sweeping around the prominent curved corner. 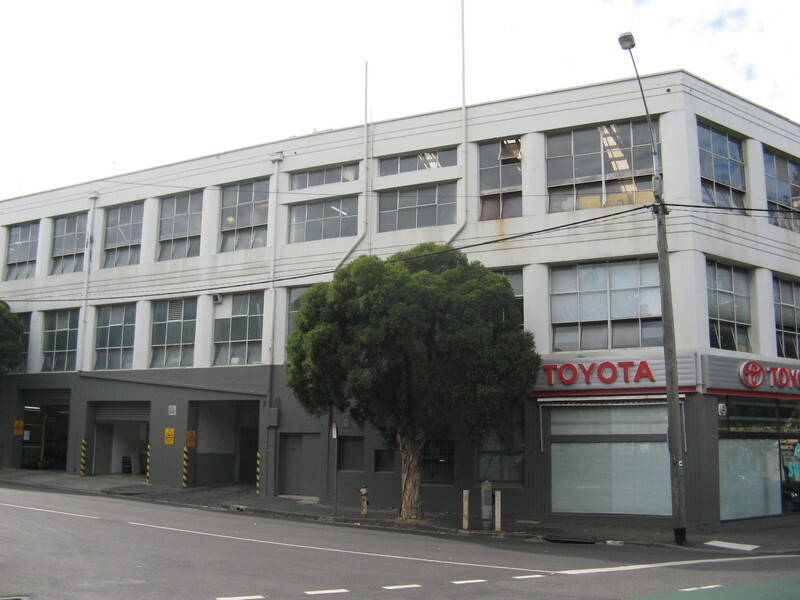 The former Melford Motors is significant for its location: motor showrooms were typically located along the northern edge of the city close to the main vehicle entrance to Melbourne, the Sydney Road, and its southern extension, Elizabeth Street. It is architecturally significant for its association with the eminent architect Harry Norris, who was one of Victoria's leading designers of office buildings, shops and showrooms in the interwar period. Motor car registrations increased eightfold in the decade 1917-1928. The number was 1,590 in July 1910 and by 1932-3 it had risen to nearly 125,000 private cars, over 30,000 commercial vehicles, and 23,000 motorcycles. The City of Melbourne saw new building types arrive as motor showrooms and garages. These were located typically along the northern edge of the City close to the main vehicle thoroughfare to Melbourne, the Sydney Road and its southern extension, Elizabeth Street. The first Ford motor cars were imported into Australia in 1905, and for the next two decades Ford vehicles continued to be supplied to Australia by dealers and distributors in both the USA and Canada. By 1914 Ford's Model T was the best-selling car in Australia, and between 1909 and 1925 140,000 were sold. To encourage the local industry before World War I the Federal Government continually increased the tariff on imported cars, increasing them from 2.5% in 1902 to 35% in 1914. In 1917 the Government banned all auto imports for a year, and after that legislated to guarantee local builders two-thirds of the new car market by limiting the number of fully assembled chassis that could be imported. Ford Australia, the Australian subsidiary of Ford Motor Company was founded in Geelong, Victoria, in 1925 as an outpost of Ford Motor Company of Canada, Limited. At that time, Ford Canada was a separate company from Ford USA. Henry Ford had granted the manufacturing rights to Ford in British Empire (later Commonwealth) countries (excepting the UK) to Canadian investors. The first Australian-built Ford was a Model T that came off an improvised production line in a disused Geelong woolstore in June 1925, while work started on a factory in the nearby suburb of Norlane. 6,541 cars were made in the following six months. The first products were Model Ts assembled from complete knock-down (CKD) kits provided by Ford of Canada. In 1928 the factory switched to the Model A and was followed by the Ford V8 in 1932. Construction of assembly plants in Geelong, Brisbane, Fremantle and Adelaide also commenced in 1925. The first locally-produced Ford vehicle, the Model T, was released in 1928, followed by the Model Y (1932), the Model 40 (1934), the Model 48 (1936) and the Model 78 (1937). The last three were designed, as well as made, in Australia. When the first locally-made Ford vehicles were released in 1928 it was apparent that authorised dealers, to showcase the latest models to the public, and authorised service facilities, to provide for maintenance and repair, were needed. Melford Motors, the name a contraction of the words Melbourne and Ford, was established as the distributors of Ford within a radius of twenty miles from the General Post Office, Melbourne. It was the brainchild of Leonard Arthur Fenton (1890-1967) a Melbourne businessman who had entered the automotive sales business in the pioneering era of the 1920s. 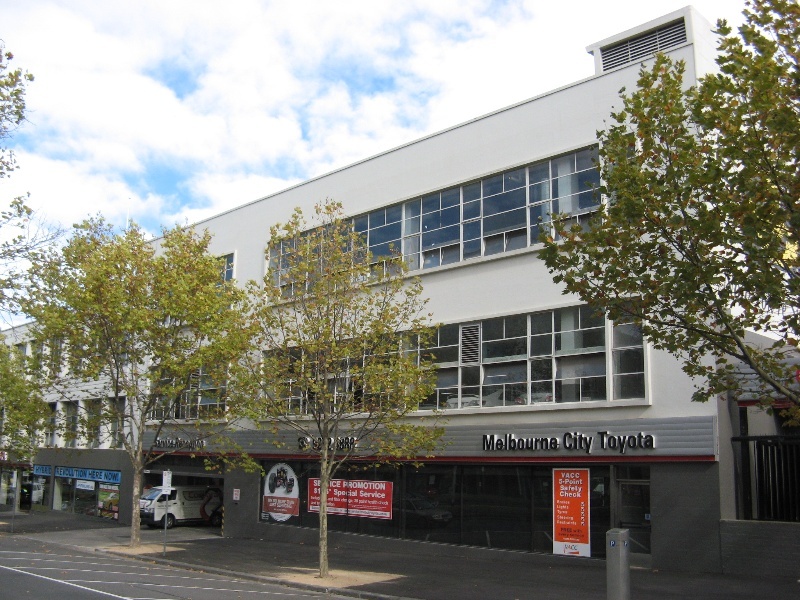 Melford Motors began operating in 1930, with spacious showrooms in Elizabeth Street, a spare parts division in Franklin Street and a service centre in A'Beckett Street. The business expanded, in 1932 became Melford Motors Pty Ltd, and later the same year moved into larger rented premises at 621-623 Elizabeth Street. This was an existing two-storey brick building which had been purpose-built four years earlier as showrooms for another leading Melbourne motor vehicle dealer, Messrs Finlay Brothers Motor Cycles Pty Ltd. Internally the building had expanses of display space on each level, with a car-washing bay, a timber staircase and a wide concrete ramp along the south wall, for vehicle access between floors, which enclosed a row of offices at ground level. Melford Motors added a new illuminated sign on the facade, with the familiar oval-shaped Ford logo in red and blue neon tubing. The showroom opened with a private display of newly-released four- and eight-cylinder Ford cars, encapsulating nine different types of saloon, coupe, roadster and tourer bodies. In December 1932 the company opened a new service station in Sturt Street, South Melbourne. By the mid-1930s the motor industry had begun to recover from the effects of the Great Depression and car sales in Melbourne were booming. Melford Motors was one of many firms that decided to upgrade their facilities. In 1936 the service station in South Melbourne was rebuilt, and the company also embarked on plans to upgrade the company's showrooms in Elizabeth Street. Harry Albert Norris was born in Hawthorn and was articled to Ward & Carleton from 1906-1911. In 1915 he advertised a tender for some semi-detached houses in East Malvern and a weather board house in Queenscliff, as 'Harry A Norris, Architect, Melbourne, Geelong, Colac'. By 1920 he had established an office in Collins Street and a rapidly-growing practice. His early works included domestic and commercial projects, with a significant number of motor garages, factories and bakeries. Norris also had an interest in the developing motor industry. In 1922 Norris was a provisional director, with Alfred M Nicholas, of Overseas Motors Ltd, a company that imported cars and parts, and by 1938 was a key player in the Victorian motor industry. Nicholas, with his pharmacist brother George, ran the highly successful Nicholas Pty Ltd, which made Aspro, an Australian brand of Aspirin. Norris's association with Nicholas led to a number of substantial architectural commissions, including the Nicholas Building in Swanston Street (1925-6, VHR H2119) and two Nicholas residences (Carn Brae at Hawthorn and Burnham Beeches at Sherbrooke (1930-33, VHR H868). Another of Norris's important clients was G J Coles, who sent him to the USA in 1929 to investigate chain store architecture, and later designed many Coles stores throughout Victoria, including the former Coles (now David Jones menswear) store at 299-307 Bourke Street (1929, VHR H2154). In addition to the Nicholas family and G J Coles, Norris's recurring clients included Kodak (Australia) Ltd, Foy & Gibson, Coles & Garrard and Preston Motors. He became Melbourne's leading designer of office buildings, shops, showrooms and retail fitouts between the wars. Norris was an early exponent of the Moderne style, as at the Block Court in Collins Street (1929), the streamlined modern facade of the Melford Motors showroom (1937) and Mitchell House in Elizabeth Street (1938, VHR H2232). The designs for the Vice-Chancellor's house at the University of Melbourne (1937, VHR H1003) in a Georgian Revival style with a horizontal emphasis, and the Mission to Seamen at Port Melbourne (1937, demolished), a confident essay in Dudokian modernism, display his versatility. Norris travelled regularly, visiting the US on numerous occasions, including trips in 1934, 1936 and 1937, where he is known to have studied commercial and industrial architecture, which certainly informed his design approach. In 1936, in what was described as 'one of the largest property transactions which have taken place in the north end of the city for some time' (Argus, 3 February 1936, p 8), Melford Motors purchased for £40,000 the property it had been renting since 1932, and at the same time purchased the adjoining property to the south, on the corner of Queensberry Street, for £20,000. This had been owned by A G Healing Pty Ltd and leased to the Myer Emporium for use as a bulk store and garage. 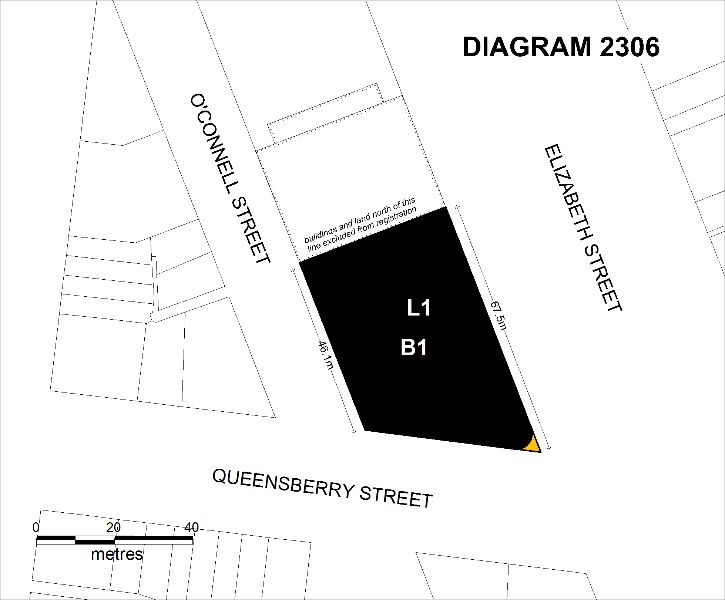 These properties provided land with a frontage of 213 ft (65 metres) to Elizabeth Street, extending back to O'Connell Street. The architect Harry Norris was engaged design a new building. Norris had carried out previously projects for automotive dealers, designed two modern two-storey car showrooms for local industry pioneers, Kellow-Falkiner Pty Ltd, in St Kilda Road, Melbourne, and City Road in South Melbourne, and also remodelled the Exhibition Street showrooms of Overseas Motors Pty Ltd (1934) and designed substantial additions to the headquarters of Rickard Brothers on Elizabeth Street (1935), just south of Melford's on the other side of Queensberry Street. Norris's brief was to retain the existing two-storey motor showroom at 621-23 Elizabeth Street and integrate it into a much larger three-storey complex that virtually filled out all available land down to Queensberry Street and back to O'Connell Street. This involved designing an entirely new building at the corner, adding a third storey to the existing premises and entirely remodelling its brick facades to create a single cohesive building with a continuous rendered frontage in the fashionable Streamlined Moderne style. The building had 117,000 square feet of floor space and 630 feet (192 m) of showroom window space. The main showroom, on the ground floor, measured 120 ft (36.5 m) by 90 ft (27.4 m), and incorporated, in the curving window at the Queensberry and Elizabeth Streets corner, a turntable to allow for vehicles to rotate as they were displayed. Toward the rear was the administrative section, and on the top floor was display space for 250 cars and trucks. The third floor was also intended as a 2,000 person space for periodical service lectures for Ford owners. The project architect was Leslie McDonald Downie (1904-1969), a senior member of Norris's staff who had played a significant role in the design of Mitchell House (VHR H) earlier that year. The working drawings for Melford Motors, mostly dated October 1936, were done by a recent graduate of the Melbourne Technical College, Douglas David Guild (who disappeared as a prisoner of war in Java in 1942). The plans and specifications were approved by the Melbourne City Council in February 1937. Construction of the Melford Motors building began in December 1936, the contractors being Swanson Brothers. The existing two-storey building on the site was partially demolished, including the parapets and parts of the south wall; the gable roof was dismantled, but its components salvaged for re-erection above the new second storey. The existing shopfront windows were removed, a new strong room and switch room added to the ground floor, and the old timber staircase was replaced by a new fire escape stair in reinforced concrete. In about February 1937 it was reported that the building would be finished some time in July. A separate building permit was granted about then for the construction of the shop fronts along the Elizabeth and Queensberry Street frontages. These comprised huge metal-framed showroom windows in quarter-inch polished plate glass, with narrower highlights above that contained panels of fixed glazing, with sandblasted lines for horizontal emphasis, alternating with narrow metal louvred vents. The stallboards, external column faces, internal flower boxes (to be planted with cacti and succulents) and entrance surrounds were all clad with glazed terracotta veneer manufactured by Wunderlich Ltd. Each of the entrances contained two pairs of glazed bi-fold doors with maple frames, while thresholds were inset with wide strips of white Sicilian marble. The floor tiles were made by the Australian Tessellated Tile Company. Other suppliers included Brooks Robinson Pty Ltd (general glazing), Australian Window Glass Pty Ltd (curved glazing), KM Concrete (steel windows) and Beale & Co (flush panel doors). On 7 April a permit was issued for illuminated signage made by Claude Neon Pty Neon on the curved corner at the street junction. This included the word MELFORD directly above the ground floor show window, the word FORD as a roof-mounted sky sign, and a huge overlapping V8 monogram in neon tubing which extended across the first and second floor windows. The building received attention from the Argus and the Age, as well as from the Sydney-based trade journals Building and Decoration & Glass. All were united in their praise. The 15 metre curved glass window that wrapped around the corner was lauded as a unique element, which according to Decoration & Glass was already a Melbourne landmark, as was evidently the 'famous V8 neon sign', which occupied a prominent position on the corner. There was praise also for the visual permeability of the building and the way the interior showrooms could be appreciated from the exterior. It was noted that internal piers had been minimised to provide an uninterrupted view and that the window glass sloped inwards to prevent distracting reflections. The Argus mentioned the use of Queensland maple panelling in the interior. The building was used to display Ford's a full range of V8 cars, V8 trucks, V8 utilities, English de Luxe Ford Cards and 10 hp Ford commercial vehicles, new vehicles in the new corner buildings, and used vehicles on the other side of the executive offices in the remodelled 1920s building. 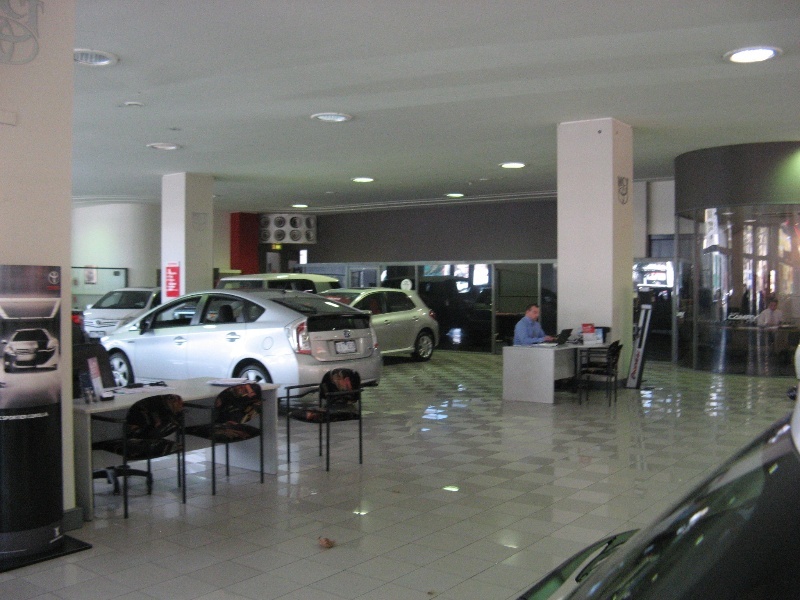 The first floor accommodated used car stocks and delivery department, while the second floor was for storage of new vehicles for immediate delivery and the servicing of used cars. 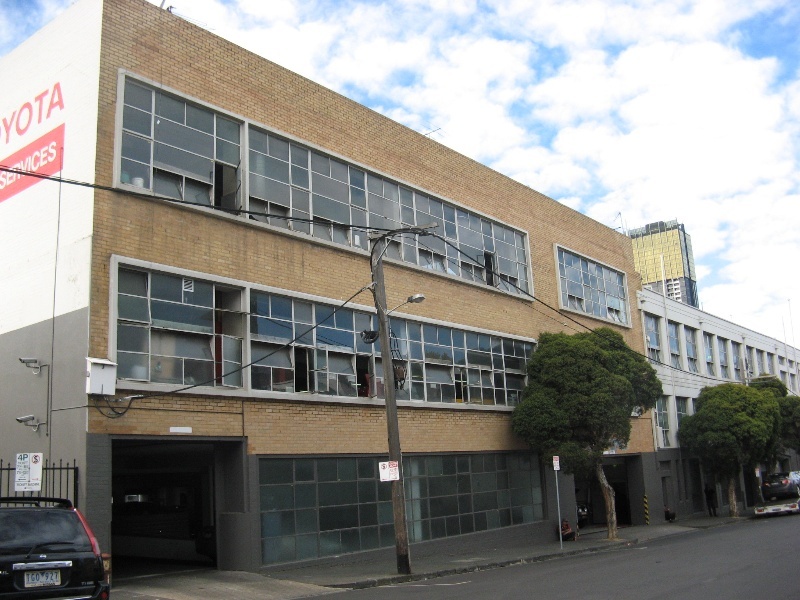 The business continued to expand in the post-war period, and in 1948 new premises were acquired at 22 La Trobe Street for after-sales service. A small perspective sketch of the Elizabeth Street premises, showing the distinctive curved corner with illuminated V8 motif and roof-mounted neon skysign served as the Melford company logo during the 1950s. By 1953 Melford Motors was described as 'one of the world's biggest Ford distributors'. In 1955 Harry Norris was commissioned to design a substantial addition along Elizabeth Street to include a new service department. It was reported in Architecture & Arts that the addition was 'designed to blend with the older adjoining building and, although on higher ground, efforts have been made to line up with the old building in the good manners of street architecture'. It was also noted that imported glass mosaic tiles, for easier maintenance, had been applied to the walls, with terracotta at the base to blend with the older work. The new wing opened on 10 June 1957. Only minor changed were made to the building in its first three decades, including the installation of window blinds (1943 and 1963), additional illuminated signage (1957, 1960, 1967 and 1969), ground floor partitioning (1954) and a new 20,000 gallon petrol tank (1968). 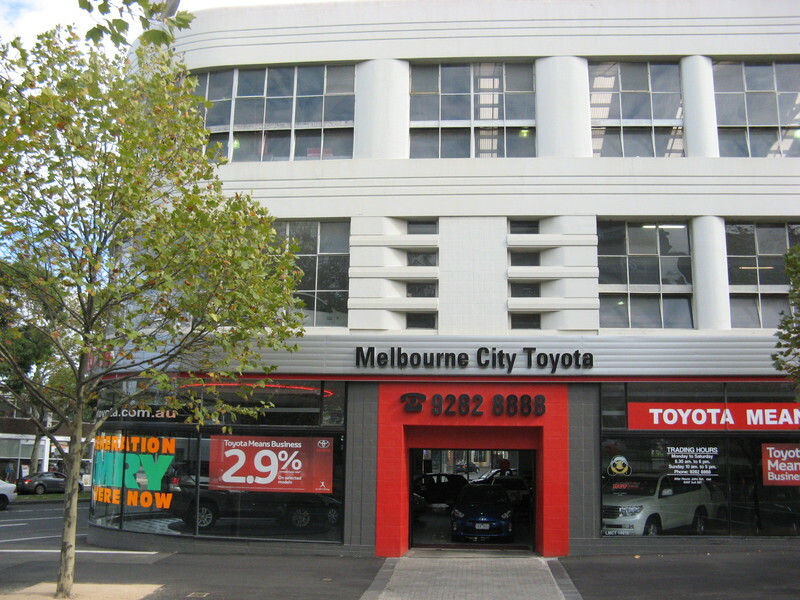 Melford Motors continued to thrive and operated from the Elizabeth Street premises until 1990, when it the property was sold to Melbourne City Toyota. A large-scale refurbishment followed, with permits issued for alterations to the car yard and offices in 1990 and for further changes to the building in 1993. The former Melford Motors is a reflection of the rapid expansion of the automotive industry, and of automotive retailing, in Victoria in the 1930s. Ford was the best-selling vehicle brand in Australia in the early twentieth century, and the boom in sales following the beginning of local production in 1928 and the easing of the Depression led to the need for the expansion of sales and service facilities. Melford Motors was formed in response to this need and its showroom was largest and grandest motor vehicle showroom built in Victoria in the inter-war period. The former Melford Motors is also significant for its location: motor showrooms were typically located along the northern edge of the City close to the main vehicle entrance to Melbourne, the Sydney Road, and its southern extension, Elizabeth Street. The former Melford Motors is an outstanding and largely intact example of a motor vehicle showroom, a new building type which appeared in the inter-war period. It is one of the last remaining substantially intact such buildings in Melbourne. It is significant as an outstanding example of the Streamlined Moderne style, which made the most of its wide street frontages to produce a building with a marked horizontal expression sweeping around the prominent curved corner. The former Melford Motors is significant for its association with the eminent architect Harry Norris, who was Victoria's leading designer of office buildings, shops and showrooms in the inter-war period. This Streamlined Moderne style building, designed by Harry Norris and built in 1936-7 as a showroom and service facility for Ford vehicles, reflects the rapid expansion of the motor industry following the beginning of local production in 1928. General Conditions: 1. All exempted alterations are to be planned and carried out in a manner which prevents damage to the fabric of the registered place or object. General Conditions: 2. Should it become apparent during further inspection or the carrying out of works that original or previously hidden or inaccessible details of the place or object are revealed which relate to the significance of the place or object, then the exemption covering such works shall cease and Heritage Victoria shall be notified as soon as possible. General Conditions: 3. If there is a conservation policy and plan all works shall be in accordance with it. Note:A Conservation Management Plan or a Heritage Action Plan provides guidance for the management of the heritage values associated with the site. It may not be necessary to obtain a heritage permit for certain works specified in the management plan. General Conditions: 4. Nothing in this determination prevents the Executive Director from amending or rescinding all or any of the permit exemptions. General Conditions: 5. Nothing in this determination exempts owners or their agents from the responsibility to seek relevant planning or building permits from the responsible authorities where applicable. Public Safety and Security : The following public safety and security activities are permit exempt under section 66 of the Heritage Act 1995, a) public safety and security activities provided the works do not involve the removal or destruction of any significant above-ground structures or sub-surface archaeological artefacts or deposits; b) the erection of temporary security fencing, scaffolding, hoardings or surveillance systems to prevent unauthorised access or secure public safety which will not adversely affect significant fabric of the place including archaeological features; c) development including emergency stabilisation necessary to secure safety where a site feature has been irreparably damaged or destabilised and represents a safety risk to its users or the public. Note: Urgent or emergency site works are to be undertaken by an appropriately qualified specialist such as a structural engineer, or other heritage professional. Minor Works : Note: Any Minor Works that in the opinion of the Executive Director will not adversely affect the heritage significance of the place may be exempt from the permit requirements of the Heritage Act. A person proposing to undertake minor works must submit a proposal to the Executive Director. If the Executive Director is satisfied that the proposed works will not adversely affect the heritage values of the site, the applicant may be exempted from the requirement to obtain a heritage permit. If an applicant is uncertain whether a heritage permit is required, it is recommended that the permits co-ordinator be contacted. Internal works: The offices adjacent to the ground floor showroom have all been modernised and works to these office spaces which do not impact on original fabric or impinge on the open showroom space are permit exempt. Works to the interiors of the first and second floors which do not impact on original fabric and are not visible from outside the building are permit exempt. The extent of registration covers the site of the 1928 and 1936 buildings. The addition of new buildings to the site may impact upon the cultural heritage significance of the place and requires a permit. The purpose of this requirement is not to prevent any further development on this site, but to enable control of possible adverse impacts on heritage significance during that process. All of the registered building is integral to the significance of the place and any external or internal alterations are subject to permit application. The significance of the place lies in its rarity and intactness as an outstanding example of a building associated with the booming motor vehicle industry in Victoria in the inter-war period, and of the Streamlined Moderne style. Any changes to the exterior of the building require a permit. The removal of the metal cladding added to the spandrel above the ground floor would be encouraged. The most significant interior space is the open showroom on the ground floor adjacent to Queensberry Street. The decoration, interior of the facade, the turntable, open space and columns of the ground floor showroom demonstrate the original function of the building. A permit is required for works to the interior of the building, the concrete ramps between the floors and the exposed trusses.